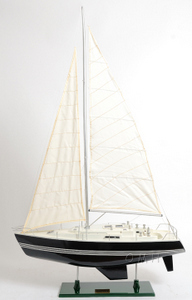 Product Dimensions (L x W x H): 29" x 9.5" x 47"
Our Victory Yacht model is handcrafted from beautiful wood such as rosewood, mahogany, teak, and along with various other exotic wood. The hull is constructed using a plank on frame method, each strip of exotic wood are carefully join together to form a smooth hull. This model is completely hand built to spec by skillful and creative master craftsmen; you will be amazed at how real it looks. The ship has a gleaming color of black along with 3 white stripes on the side of the hull. On the top, you can spot gorgeous white painted wood trims along with others amazing details. Eye-catching details such as: metal main mast, metal boom, creamy white sails fabric with detailed hand-stitching, shiny metal captains steering wheel, metal railings surround the boat, tinted windows, metal knick-knacks and much more. All these detailed ornaments contribute to the beautiful wooden Victory Yacht model. An attached wooden stand with a nameplate engraved Victory comes standard on this model. Our model was built according to scale through original plans, pictures and drawings. We absolutely use no plastic parts only the highest quality wood and metal parts. The masts are carefully fold flat down for easy shipping purposes. 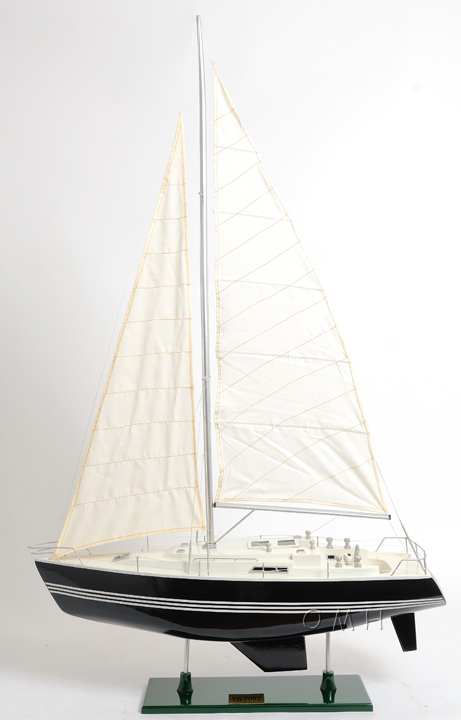 Inspired from the beautiful and magnificent sailing yachts of today, this stunning wooden sailing ship is based on blueprint plans of real life sized sailing boats. It is exquisitely hand crafted by master craftsmen and then beautifully painted its original colors. Sailing on the open seas has for centuries lived in the hearts of man. The feelings of freedom found while becoming one with the vast waters of the oceans, the magnificent and fiery sun above, and the mysterious moon and stars of the night. Being driven by the bountiful winds and overcoming with the fierce storms at which they are at the mercy of out on the open waters. With this beautiful and inspiring wooden sailing ship you will ignite that passion within your heart or the hearts of those you may gift it to. It is a symbol of a memory for those who have experienced the fascinating journey out to sea or a reminder and inspiration for those who dream of sailing the vast open waters to new and intriguing lands they have not yet traveled to.